No doubt about it there was significant damage done this week, but as I’ll point out not that bad (to date). The chart below shows the big sell off on Wednesday. This we were expecting, but not so much and so quickly. I’ve labeled the swing peak of the early part of the week “ut” for Up Thrust. There could be a case to make that this was an Up Thrust After Distribution (UTAD) since the thrust was on light volume (circled) coming after a Test downwards around March 12th. But, this is a pretty minor formation so far. The Money Flow indicator (at the top) is mildly negative and the Sentiment indicator has just turn “bearish”, so the “Caution Flag” is waving. Note that the price action on Thursday was holding near the previous swing low in mid-March. Now could this be a manipulation to drive stocks down right before the end of the 1st quarter so that (some) “smart money” folks could get on board before the end of the period? I’m not a conspiracy theory guy, but this just looks “convenient” to me right now. Here’s what I’m seeing: First, market leadership. As of the close on Friday, it really has not changed. Biotech, Semiconductors, Consumer Products, Retail Discretionary and Healthcare are the leaders, the same ones for the past month +. I don’t see a rotation out of the leaders just a rapid depression of their prices. 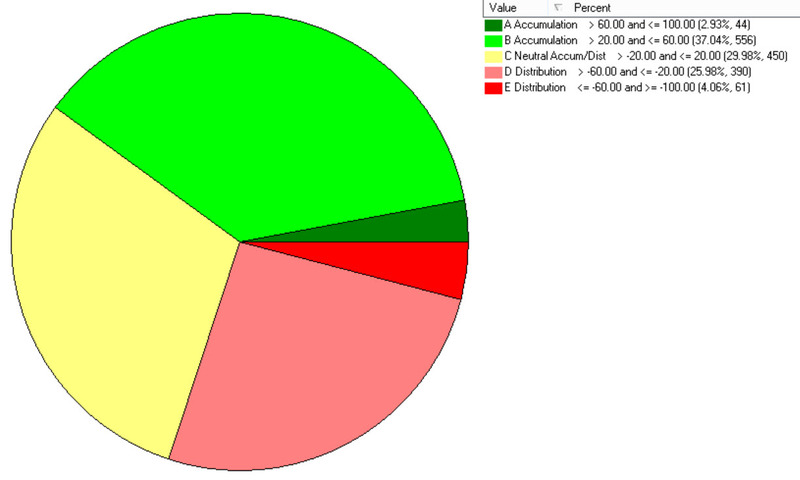 Secondly, overall market Accumulation & Distribution. The pie chart below (stocks in the S&P 150index) shows a lessening of buying (green) but mostly headed into the “neutral” area. Thirdly, “price strength”. 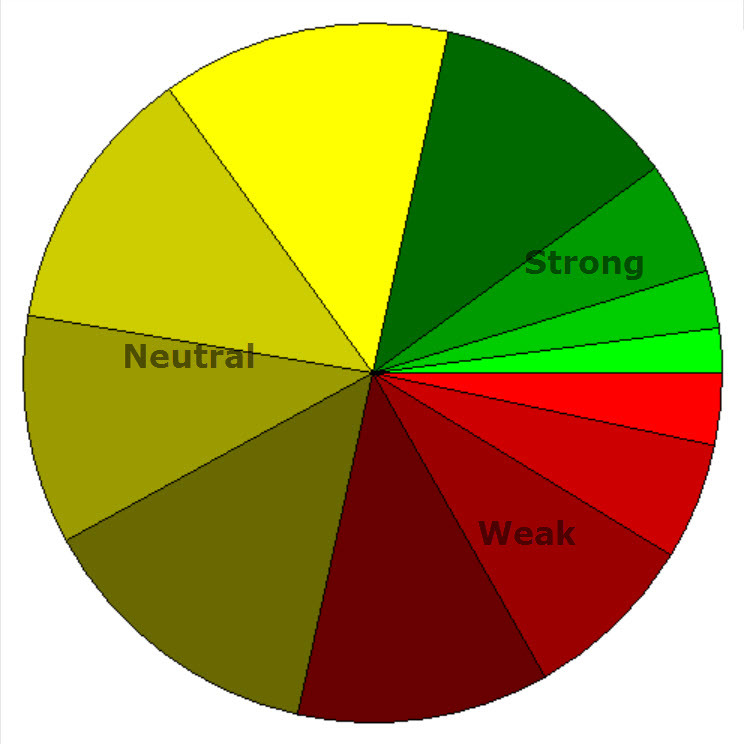 This pie chart (again, of stocks in the S&P 1500 index) shows less “green” that a few weeks ago, but that too appears to have headed into the “neutral” camp. Bottom line is Yes this market has taken a hit and is weaker than a week ago, but we should keep things in perspective. What caught everyone by surprise is the sudden one day drop on Wednesday (because of . . . fill in the blank). Economically, nothing really changed on Wednesday, except folks got nervous; the market was over bought and “due” for this. What is important is what happens next week. Is there follow though lower past Monday morning (amateur hour), or do the buyers step in at these lower prices? 4810 is an important level on the NASDAQ. A close below and there is too much “air” below it for me. Let’s let our stops take us out naturally (or hedge out our positions) and watch the volume. Have a good week & keep an eye out for the next move, which ever way it goes. ………. Tom ……….